Earth's moon — a propellant depot for the future? Earth's moon taunts. A growing chorus of experts views this "eighth continent" as a nearby world of natural resources sitting there at the edge of Earth's gravity well, ready for the picking. Visionary zeal aside, clarity is step one. Wanted is the right combination of vision, gobs of moon moolah, make-it-happen technologies and the political willpower to unlock the moon's wealth. A recent report — "Commercial Lunar Propellant Architecture: A Collaborative Study of Lunar Propellant Production" — has cut to the chase, detailing what's needed and what happens next. This appraisal by industry writers, NASA, lunar scientists and space lawyers focused on extracting water from the moon's permanently shadowed regions for use as rocket fuel. The report explains that, combined with reusable upper stages and landers, a space-based supply of propellant has long been seen as the key that could enable cost-efficient access to much of the inner solar system. Moreover, the recent confirmation of lunar polar volatiles provides an access point to a supply line of in-space propellant. Refueling can "linearize" the rocket equation, the study suggests. A newly developed extraction technique for deployment on the moon called thermal mining makes use of mirrors to exploit sun-shy, water-ice-laden polar craters. The over-170-page assessment points to an untarnished belief: "In the desert, gold is useless and water is priceless." Past science missions to the moon have provided direct evidence that sun-shy regions near the lunar poles are repositories of water ice. Once validated via ground truth, this resource could also be split into hydrogen and oxygen via electrolysis. The oxygen could then be used for life support, and hydrogen and oxygen can be combusted for rocket propulsion. But there's more. Thanks to the moon's shallow gravity well, the paper argues, those water-derived products can be exported to fuel entirely new economic opportunities in space. NASA's Kilopower project: The power level provided would be suitable for accessing, extracting and processing lunar ice in permanently shadowed craters and would help demonstrate propellant production, advocates say. The study has identified a near-term annual demand of 500 tons (450 metric tons) of lunar-derived propellant equating to 2,700 tons (2,450 metric tons) of processed lunar water, generating $2.4 billion of revenue annually. That's a celestial ka-ching factor that shouldn't be ignored. The initial investment for this operation, the report suggests, has been estimated at $4 billion, about the cost of a luxury hotel in Las Vegas. "This was a very significant and thorough joint effort by industry, government and academic experts to put together a detailed and realistic analysis," said Angel Abbud-Madrid, director of the Center for Space Resources at the Colorado School of Mines in Golden. "It lays out the approach, challenges and payoffs of developing a private business to harvest and process lunar polar ice as the foundation of a lunar, cislunar and Earth-orbiting economy," he told Space.com. The report provides specific suggestions for both the public and private sectors to collaborate and accelerate moving forward, Abbud-Madrid said. "Literally, no 'lunar rock' was left unturned!" A government-sponsored, private-sector resource robot could characterize and map ice and other substances in almost permanently shadowed areas of the moon. But the report also acknowledges that a commercial lunar propellant system will be a vast undertaking. A phased approach is recommended, each phase serving to increase the maturity of the technologies, attract increased levels of investment and develop markets and customers. — Establish benchmarks proposed by NASA and others regarding propellant demand, price and location of use as customer base. — Undertake prospecting and science exploration of lunar polar regions. — Develop improved space law to facilitate commercial use of lunar resources. — Form commercial lunar propellant companies to manage the many subcontractors. — Secure investment for technology development and maturity. There are many challenges ahead for moon-mining companies, as well as those moving onto Mars. Most are technological, but others require legal solutions. As the report notes, there are potential legal issues. "There are many challenges that lie ahead for these emerging space-mining companies. Most are technological, but others require legal solutions," the report points out. Several possible issues stand out, according to the report. For moon mining to really take off, the right to own any extracted resources must be affirmed, along with priority rights to mining claims. Noninterference in mining operations should also be a guiding factor, as should the need for regulatory clarity without excessive regulation. Promulgating the new report is George Sowers, a professor of space resources at the Colorado School of Mines. "My main targets have been NASA senior management. 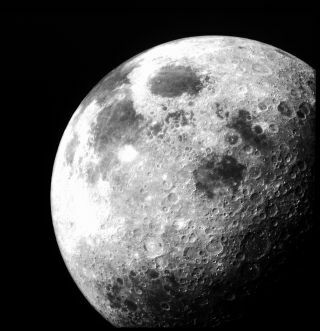 I'm trying to push them into making a concerted effort to go after lunar ice for propellant production," Sowers told Space.com. His primary objective is to develop a consensus on the way forward. Allies within NASA, Sowers said, "have been pushing lunar propellant in-situ resource utilization [ISRU] to be a part of the baseline lunar return program but with limited success. Several heavyweights are against it." Commercial use of lunar polar volatiles provides an access point to a supply line of in-space propellant. Sowers said it's the same old conundrum: "If we haven't done it before, we can't make it part of the baseline. But if it's not part of the baseline, it doesn't get funded, other than a few pennies from the diminishing technology pot." One of the objectives of the report, Sowers said, was to show that all the individual pieces of the commercial lunar propellant architecture are straightforward. On a more encouraging note, Sowers senses that lunar ISRU may be getting the traction it deserves by NASA this year. But, he added, "I'll believe it when I see it." Leonard David is author of the forthcoming book, "Moon Rush: The New Space Race" to be published by National Geographic in May 2019. A longtime writer for Space.com, David has been reporting on the space industry for more than five decades. Follow us on Twitter @Spacedotcom or Facebook.